Check out the music line up on our 2019 programme! 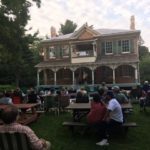 A very successful On the Verandah 2018 season has drawn to a close. We would like to thank the wonderful 14 musical groups who entertained us each night. Some of the groups have supported Friends for many seasons. 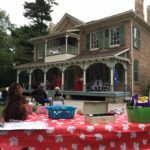 This year there were 5 new local groups. Friends would like to thank our generous sponsors, CRH, Samuel & Sons and Petro-Canada Lubricants Inc. Thank you to Joyce Delves for her organization & dedication to OTV and all the members of Friends who helped at each concert. Our volunteers Nataliia and Daniel were invaluable. Thank you to the Museum staff who were there early every night to setup & direct parking. They stayed late at Benares to pack up each evening long after we were gone. A huge thank you to our enthusiastic crowds. We recognize the familiar faces of people who have attended for years. This year we were so pleased to see many new faces. Your nightly donations will help to fund buses that will transport students to the educational programs at the Museums. See you again in 2019 starting the first Friday in June through to the last Friday in August! Until we meet again! 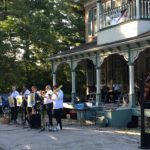 On the Verandah featured ‘Jazz Plazma’ on Friday July 6, 2018. While the musicians played and sang, three local artists from Mississauga, Leo Dias, Nisreen Askar and Sungmi Kong, were live painting. At the end of the evening, their artworks were donated as part of our Silent Auction. 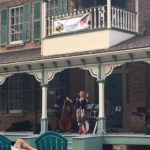 Friends of the Museums Mississauga is grateful to the musicians and artists for their creative contributions and volunteer spirit. 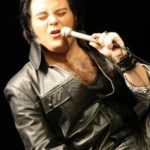 On the Verandah will feature Elvis Tribute Artist Anthony Joseph Carbone on Friday, August 18, 2017 at 7:00 pm. 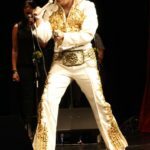 Anthony is a 23 year old Elvis Tribute Artist from Hamilton, Ontario. He is currently enrolled in the Applied Music program at Mohawk College specializing in Classical Vocal. 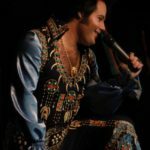 Although he performs all eras of Elvis, he specializes in his authentic recreation of the 70s Concert Era. His favorite Elvis song is “Unchained Melody”. You won’t want to miss this unique concert – bring a chair and be prepared to sing along to the timeless hits of Elvis! 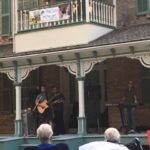 2017 On the Verandah Season – thank you to all of the artists and audience for your support! (pictured above) – Rob Tardik performs smooth jazz for the audience. An annual favourite! 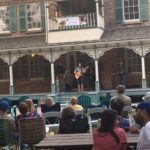 Join us every Friday night at 7:00 pm for On the Verandah. 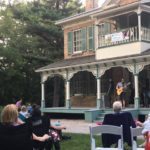 Live music on the prettiest stage in Mississauga – the verandah of Benares House on Clarkson Road North. 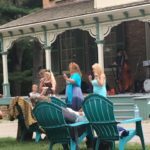 Bring a chair and enjoy some great music! Brought to you by Friends of the Museums of Mississauga. See you there!